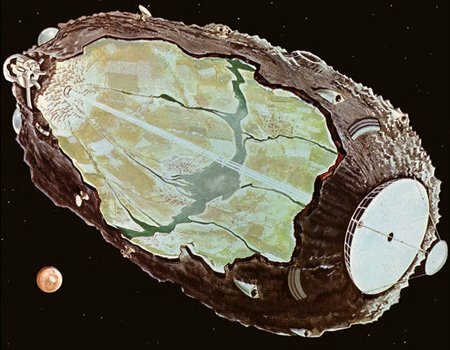 Building a Space Station Inside a Giant Asteroid? It sounds like something out of a sci-fi movie, but it’s a wild possibility scientists are actually exploring: how to fit a space station inside an asteroid.Why attempt such a bizarre feat of astro-engineering? Because the spin of the asteroid would create enough gravity for mining equipment to be effectively used, giving us a way to tap into the rich minerals and deposits inside these celestial rocks. In addition, researchers suggest the asteroid’s rocky hull could also help keep the mining station safe from the dangers of being out in space – cosmic ray radiation and all. This crazy idea might just be possible, according to a new study from astrophysicists at theUniversity of Vienna in Austria, who applied some advanced gravity models to a hypothetical asteroid measuring 500 metres by 390 metres (1,640 feet by 1,280 feet). Researchers are preparing for missions to capture asteroids and bring them closer to the earth, where they could one day be mined and even provide a source of fuel for interplanetary spacecraft. Richard Branson Says He’ll Fly To Space By July… AGAIN!